Seconds away from the fun in Historic Riverside! Stay on the scene in this adorable 1940s duplex suite in Historic Riverside! Located next door to the King Street District, enjoy walking to the restaurants, bars, cafes, and shoppes nearby. Business professionals and/or medical interns will be pleased with the very close proximity to the downtown offices and several hospitals. Trip for pleasure? You’re covered as well! Anything you’d want or need is either a very short walk, bike, or drive away! We welcome you to be our guest and experience our neighborhood! 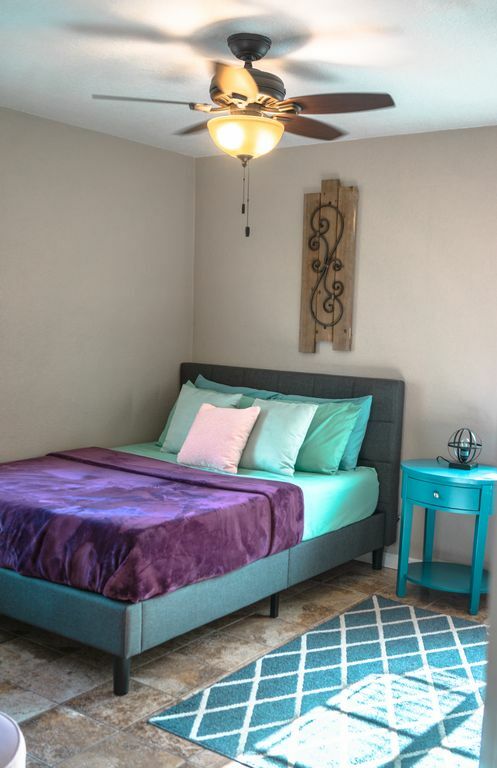 This comfy unit is located on a large corner lot and has lots of hip/trendy charm to share. The home is located in an urban setting and extremely close to all of the action, so there’ll be some outside foot traffic of those coming/going from the bars, shoppes, and restaurants. However, by and large it’s generally very quiet. Historic Riverside-Avondale is one of the absolute most desirable and expensive areas Jacksonville has to offer, yet the popularity is still steadily increasing due to continued enhancements and development. We welcome you to our little corner of the neighborhood! Listed in the National Registry of Historic Places, Riverside is one of Jacksonville’s oldest and coolest neighborhoods. Voted as one of the country’s top 10 Great Neighborhoods, Riverside & Avondale have a unique mix of history, culture, and modern design. This is a hip part of town with a diverse population. Widely known as the most popular hot spot in the city, this coveted location continues to grow. This neighborhood has been credited as one of the most beautiful in America, with its oak-shaded streets and waterfront views of the St. Johns River. The vibe here is that of community, urban living, and keeping it local. Riverside’s Historic Five Points area is a bohemian neighborhood with funky coffee shops, outdoor cafes, one-of-a-kind shopping, nightclubs, antique stores, and more. Another local food & beer district can be found on King Street, where locally owned restaurants, bars, and breweries are calling the street home and bringing in hundreds of visitors of all ages every night and weekend. Riverside is one of Jacksonville’s most walkable neighborhoods. You can also bike or get quick Uber service at any time. I am a 35 year old triathlete who loves being outside, planting vegetables, and making friends. Greg and I absolutely love living in Historic Riverside, where countless events are in walkable (or bike-able) distance. You'll easily catch us taking advantage of the perks of this vibrant area of the city. We’re in the center of the fun in Jacksonville! Festivals, races, concerts, sports, and more are continuously accessible nearby. We are both excited and happy to welcome guests to our extra unit. Aiming to provide all of the Southern hospitality, comfort, and courtesy that you expect while visiting; we hope you feel right at home during your stay. Greg and I are right next door, so we’ll be able to check on you whenever we are available! Since we both work full time, it is best to contact us via text/email. New sink and medicine cabinet installation. Access to Jacksonville's fun urban core is only 1 mile away. Stackable unit provided for guest use. Parking available on the street directly in front of door. Keurig with an assortment of flavors, as well as sugar and creamer. Smart TVs for streaming movies/shows located in living room and master bedroom. Cable is not provided. Fully fenced front and back yards, and with outdoor seating. Clean and convenient in Riverside! The owners of this property have gone out of their way to make this a positive experience. They have welcome gifts for you, and an extra clean place with pleasant indoor and outdoor spaces. The beds are comfortable, and basic items are provided (dish soap, paper towels, spices, toiletries and more). Riverside is convenient to the major expressways so it is easy to get to any area of Jacksonville, including the beaches. We would definitely stay here again. Excellent location - close to everything but on a quiet street. The property was super clean with plenty of space to relax indoors and outdoors. The hosts go out of their way to make guests feel welcome and comfortable with plenty of extras and personal touches. Everything seemed new and worked perfectly. We're so happy we found this place! It was a pleasure hosting your family, Amanda! Loved the new interior and yard. I will return to this location for sure! It was truly a pleasure hosting you, Tina. The apartment was exactly as pictured on VRBO. Christin and Greg were excellent hosts. We felt extremely welcomed i e. Chocolates, wine and goodies. The beds were extremely comfortable and the neighborhood was very charming. It was nice to feel at home while being away from home. This was a weekend I will remember for many years. Thank you for this wonderful experience. It was truly our pleasure, Debra. You’re a wonderful guest! Kristin and Greg are perfect hosts and have set up this charming two bedroom duplex with everything one needs for a pleasant stay. After learning that I am a "beer person," Greg even set me up with three crowlers of various beers from an excellent local brewery. They are responsive, concerned-- just good people. The location is just a couple of blocks from King Street, which has several excellent restaurants and watering holes. If you're staying longer, the antique shops and other shopping to be found at Five Points is not far away. With everything there is to do, I still chose to spend one evening at "home," cooking dinner in the completely equipped kitchen and reading a good book on the comfy sofa. As a bonus, there is a furnished gazebo outside that's perfect for pre-dinner cocktails. You cannot go wrong staying with Kristin and Greg! Always a wonderful pleasure hosting you, Judge Stevenson! Don't just take our word for it-- check out what others have to say about Riverside's action!